After this weekend ordeal, I needed to eat something to soothe my mind…Pasta especially pasta in bianco (with burro e parmigiano, butter and parmesan) is a dish that always remind me of when I was a child and sick, my mom would cook this dish for me who supposedly helped to cure whatever sickness one may have. It did not but, it’s sometimes good to believe it. You cannot tell an Italian how to cook pasta, it’s ingrained in their DNA…Like the Swiss and skying, it seems like they’re born with skies on. There are indeed many ways to cook pasta, one less known method is called “risottata“, meaning like a risotto where broth is added gradually. I did not come up with it, it’s a very old Italian method of cooking pasta! so, no pasta is not always boiled in salted water, drained and served topped with sauce. There is an interesting and funny article in English about the different cooking methods and cooking time of pasta on Identità Golose. My father loves pasta overcooked…well at least well cooked, my mom and I, if it’s not VERY al dente, we don’t eat it, so usually the al dente eaters, take the pasta out of the pot first while the other ones can wait a while longer. He always looks at us horrified, mà come potate mangiare la pasta così cruda???? (how can you eat pasta that raw), well we can. Pasta risottata being cooked a long time, takes longer than the usual way of boiling it in water. The risottata method allows it to keep its starch, therefore develop a particular creaminess (I wanted to show that creaminess on that second photo even it’s a screaming, right in your face type of a picture! )…can you just imagine the deliciousness of the pasta while having absorbed all that flavorful broth? It’s really my favorite way to cook and eat pasta. You need to try to believe it. For this cooking method, you need short pasta (pasta corta) such as small penne, or anything that size. The recipe is quite simple, the greatness of the pasta comes first from the risottata method, then the combination of the ingredients make it a real treat. Heat olive oil in a pan and add garlic, stir for a few minutes, then add zucchini, cover and let cook until the zucchini start to be cooked but firm, then add tomatoes, salt and pepper. Let cook until the tomatoes start to soften. Set aside. In the meantime, blanch fava bean grains in boiling water for about 2 minutes depending on the size of the grains. IF the grains are small and tender, one minute is enough. Drain and peel beans. Add to the pan with the other vegetables. In a pot, heat olive oil, add shallots and brown them. Add pasta and proceed like you would for a risotto, adding gradually broth to cook it. 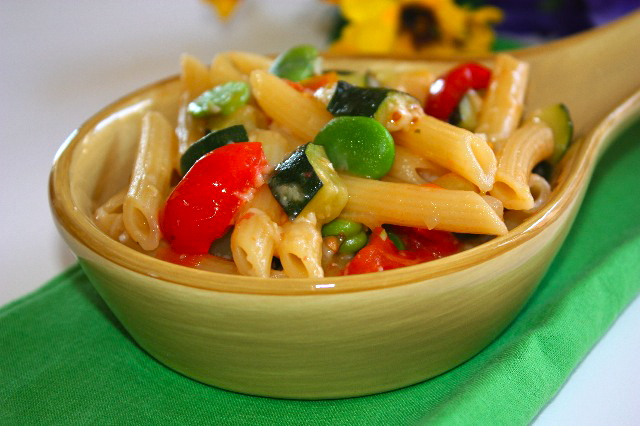 When the pasta has reached the desired consistency (it will need to be slightly creamy), add vegetables and parmesan. Stir well and serve hot. This entry was posted by silvia on May 12, 2010 at 5:58 am, and is filed under Pasta, Vegetarian - dairy. Follow any responses to this post through RSS 2.0.You can leave a response or trackback from your own site. I will try this. Sounds fab… always finding new ways to cook pasta. Love it. What a great new way to cook pasta. 2nd pic looks so yummy. Come join us on the foodie exchange for you own exchanges. Thanks for the introduction to this technique. I must try it! And buttered pasta with cheese is definitely comfort food, too! Love the close-up in the second pic! The pasta looks delicious! What a great meal at your new home! hehe…. Have a nice day! Thanks for teaching us the risottata method! Sounds just excellent and I can’t wait to try! Je ne connaissais pas cette méthode et merci de la partager! Avec un père élevé par une grand-mère italienne et qui adore les pâtes, je suis heureuse d’avoir d’autres idées qui changent des plats hyper classiques, vus e revus 100000 fois! A very special pasta treat! I love it with fava beans. 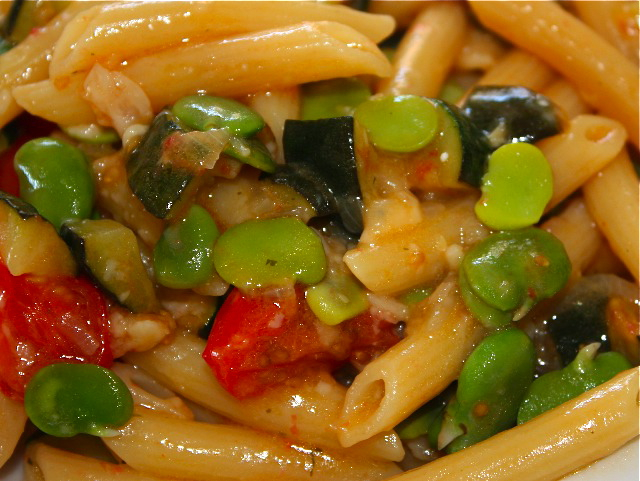 I love fava beans and never thought of using them in a pasta dish. Looks delicious…but I think everything looks delicious on your site (well, except for the meat, but that’s my thing). I hope it did the trick and made you feel better! i didn’t know you could cook pasta like that – amazing! i am definitely going to try this soon! i am like your father, i like my pasta overcooked. the texture just agrees with me more for some reason, even though al dente does seem to be the more sophisticated method. I’m really so happy that your blog is back on its feet so fast. Love your pasta….simple and delicious. I think I like my pasta well cooked but not overcooked. I love that there’s still a bite to it. So, it that pasta risotto-style? Gathered from the name ” risottata”…..just guessing. Hope this comfort fish comforts you totally, or at least from that sickening virus. Pasta was made to soothe the soul. Wow, amazing. I have never heard of cooking pasta this way but it looks wonderful! And I adore fava beans so this is perfect! yum! it look superb. It making me hungry, even after having my big lunch…. This looks wonderful and I can say that I actually prefer this method as the flavour is even better than boiling and draining! so interesting to cook pasta in this way!the pasta dish looks wonderful! I remember making a recipe once with this method, only using orzo. It was to mimic risotto. Going to have to try it with these larger noodles. I do love how the pasta absorbs the broth and gets so flavorful. very yummy pasta. Thanks for sharing.